Baked beans. Comfort food for cookouts and tailgating. Goes well with hotdogs, barbecue and hamburgers. Good Eats Food Co. Division, Lakeside Foods Inc.
“We looked at each other and said, ‘That’s it!’” Brown recalls. SER!OUS Bean Co. was born. It also gained a mascot – ACE, a cartoon bean that wears different outfits that correspond with the beans’ flavors and themes. “We want to be playful and fun,” Brown says. SER!OUS Beans is part of Good Eats Food Co., which includes a line of frozen foods, such as mashed cauliflower and sweet potatoes – known as “smashers” – packaged in dollops, enabling consumers to break off and cook what they want and save the rest for later, as well as soup and Mexican-style corn. In less than three years, these products became available in groceries nationwide, including 2,600 Walmart stores. 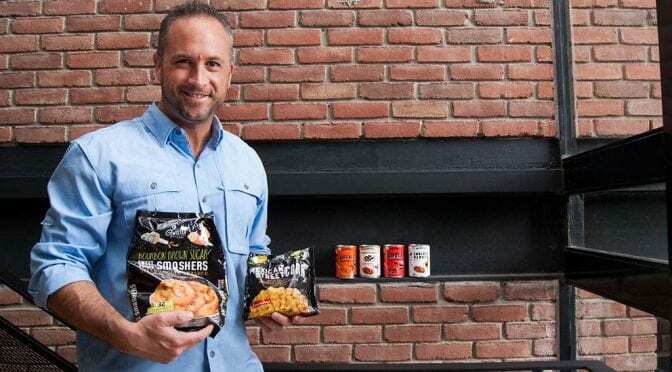 Then, in June, Good Eats was acquired by Lakeside Foods Inc. of Manitowoc, Wisconsin, which has 13 plants that provide frozen and canned products to 14 countries. Both Brown and Taylor are keeping operations in Fayetteville with Brown serving as vice president of sales for both Good Eats and Lakeside while Taylor leads marketing and innovation efforts. Brown, who grew up in North Little Rock, has a long history in the food industry. After graduating from the Walton College in 2000 with a business administration degree, he was logistic manager for Allen Canning Co. He worked his way up to director of national account sales when Allen purchased a portion of Birds Eye Foods. Brown stayed with the company when it was acquired by Sager Creek Vegetable Co. as vice president of food service sales. His clients during his career included Kraft, Campbell Soup, Nestle, Cracker Barrel and TGI Fridays. Also working at Sager Creek was Taylor, vice president of marketing. He approached Brown about starting a food company after they both had witnessed what Brown calls “white space” in these product lines. “There wasn’t a ton of innovation going on,” he says. There also wasn’t a ton of money to get the venture rolling. Brown and Taylor drafted a business plan for a line of gourmet foods and met with Clete Brewer, managing partner with New Road Capital Partners in Rogers. They pitched their idea and New Road agreed to invest. In September 2015, Good Eats Food Co., with the motto “Veggies with a twist!,” was up and running. They made a trip to the electronics store to buy a couple of laptops, which had no office software. An email address for business correspondence was still in the works. A temporary office was created on the fly – Brown and Taylor reserved a room at the Fayetteville Public Library. From there, they plotted strategy. They conducted online surveys and focus groups, and they also made observations of their own. The first venture was canned baked beans, and they had two chefs come up with original flavors. Not only were they offering a new spin on the culinary standard, they packaged the beans in BPA-free cans with a pull tab, eliminating the need for a can opener. They then focused on cauliflower, a versatile, low-carb vegetable that has gained popularity with consumers. The only problem, Brown says, is that cauliflower can’t be canned. That’s when they started a frozen food line with Ruthie’s Twisted Harvest Cauli-Smashers, mashed cauliflower with Parmesan cheese and crushed garlic. Other frozen products followed with Ruthie’s Twisted Harvest VeggieBowl soups (there’s chicken noodle, chicken and rice, minestrone and tortilla) and Ruthie’s Twisted Harvest Mexican Street Corn. Brown says Lakeside’s sourcing, manufacturing, product development and logistics expertise will help Good Eats in its development. Walton has played a role in shaping Good Eats Food Co. both directly and indirectly, Brown says. Entrepreneurial students have worked with Good Eats as class projects by exploring how a new brand plays in different channels – some of the students even pitched the products to area grocery store managers. Brewer’s involvement, as a Dean’s Executive Advisory Board member, reflects Walton’s mission of entrepreneurship and innovation. The University of Arkansas also assists through its food science program, which conducted canning tests for SER!OUS Beans. Brown says Good Eats will continue to introduce unique products and flavors for Lakeside along with special, limited edition products. “It’s all about timing and what we can take on,” Brown says. The Office of Entrepreneurship promotes entrepreneurial activities at the University of Arkansas and throughout the state. We support programs designed to help students and faculty commercialize their ideas through start-ups. We like to hear from Walton grads.